In the High Desert of California, the nation’s proving ground (and airspace) for advanced space launch vehicles, and the HQ for many of the companies of New Space, Interorbital Systems (IOS) engineers are hard at work preparing for a critical milestone in the development of the company’s NEPTUNE Rocket series. 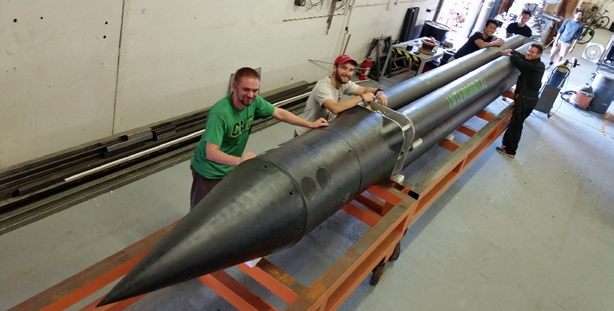 The Interorbital team is nearing completion of its N1 GTV (NEPTUNE 1 Guided Test Vehicle) rocket which incorporates a high-efficiency CPM 2.0 filament-wound tank assembly, its new rocket engine gimbaling systems, its new CPM Controller, and a new in-house developed guidance system. The finless single CPM (Common Propulsion Module) launch vehicle will be used in an upcoming Q4 2017 low-altitude flight test. Eleven commercial and educational CubeSat and TubeSat payloads are manifested on this flight. The rocket — a CPM 2.0/ N1 — is composed of four identical tanks containing the rocket’s storable propellants and pressurant gas. This regulated pressure-fed configuration was selected to increase engine performance, while at the same time reducing costs and manufacturing time. During the test flight, the rocket will simulate an orbital launch trajectory by using the main rocket engine’s throttling capability to vary the thrust-to-weight ratio, thus simulating the actual conditions that will be experienced during an orbital launch. After the rocket passes through the transonic phase and Max Q, the engine will gradually throttle down, slowing the rocket until it begins to hover. At that point, the rocket engine will shut down and the rocket will be allowed to fall. At a safe altitude, a parachute will deploy for vehicle and payload recovery. Following the test of the N1 GTV launch vehicle, the IOS team will construct an orbital version of the N1, which consists of a single CPM 2.0 and two liquid upper-stages. It will be capable of placing a 14 pound (6.4 kg) payload into a 192 mi (310 km) polar orbit — perfect for the dedicated launch of the new 3U-CubeSat plus 1U propulsion system assemblies now trending in the smallsat industry. 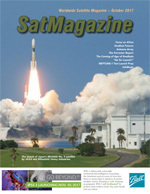 As the N1 launch vehicle is 36 feet (11 meters) in length, and weighs only 5,400 lbs. (2449 kg), this will be the smallest orbital launch vehicle in the world. The NEPTUNE 1 is also the world’s lowest-cost orbital launch vehicle, with a base price of $250,000 (academic price) per launch to a circular polar orbit at 310 km. The same single Common Propulsion Module that powers the N1 can be bundled into groups of three, five, or eight to meet increased lift requirements for payloads weighing up to 500kgs (1,100-lbs). IOS NEPTUNE-1 being prepared for launch. The Spacelink Secure radio, developed in collaboration with Space Inventor of Aalborg, Denmark, is a fully redundant UHF transceiver operating in the UHF band refined as a hardware pair with a ground station source for Internet of Things (IoT) connectivity experiments — AES/GCM Encryption addresses IoT security concerns. Spacelink is the first in a series of highly capable radios that are expanding into S- and X-band frequencies. These radios are low-power, lightweight solutions for CubeSat applications; the Spacelink radios are destined to be an enabling technology for various Use Cases including connected cars, oil and gas industry, agriculture, etc. Stanford University’s XLAB is focused on the development of micro- and nano-systems for operation within extreme harsh environments. Researchers in Stanford’s XLab are investigating the synthesis of temperature tolerant, chemically resistant, and radiation-hardened wide bandgap semiconductor thin films and nanostructures. These new material sets serve as a platform for the realization of sensor, actuator and electronic components that can operate and collect data under the most hostile conditions. More specifically, smart and adaptable structures for extreme environments are enabled through the technology developed in the XLAB; research efforts support a variety of applications including deep space systems, hypersonic aircraft, combustion monitoring, and subsurface monitoring. With respect to Wayfinder II, the Extreme Environments Lab has created a hosted payload known as SHARK—1. The Principle Investigator for this effort is Karen Dowling, a Ph.D. candidate at Stanford. The purpose of this experiment is to test AlGaN (Gallium Nitride) sensors and others to measure magnetic fields, temperature, and radiation in orbital and suborbital levels. Mitigation to susceptibility to extreme environments is an important area of research for LEO applications and beyond. Graphene, which is one of the crystalline forms of carbon, is a relatively recent discovery in 2004. Since then, a torrent of data has been uncovered by the academic community and industry on its advantages, including ultra-thinness, mechanical strength, heat conduction and electronic properties. In this collaboration, a team led by Professor Barbaros Özyilmaz, head of graphene research at the NUS CA2DM, prepared the graphene material by coating a substrate with a single layer of graphene. This is about 0.5 nanometers thick, which is more than 200,000 times thinner than a strand of hair. Interorbital’s suborbital launch opportunity offers materials scientists the ability to collect real-world Graphene flight research data that is extremely relevant to a program like the highly anticipated Breakthrough Starshot. 4. Robotics Payload provided by Google Lunar X PRIZE Team Hakuto, ispace, inc.
Boreal Space will host a robotics experiment provided by TEAM HAKUTO, https://team-hakuto.jp/en/. Team Hakuto is a contender for the Google Lunar X PRIZE. Their mission is to privately develop a spacecraft to land on the Moon and then be able to move their robotic payload more than 500 meters plus then send high resolution images to Earth (HD, 360 degree images called “Mooncasts.”) They are Google Lunar X PRIZE contenders, one of five teams racing to the finish line. One of three Mexican smallsats scheduled to fly on IOS’ suborbital launch includes Juan Diaz Infante’s Project ULISES I TubeSat Arts/Music satellite. The other satellites are from UNAM and University of Zacatecas. At press time, following the recent 7.1 Mexican earthquake, IOS is awaiting word on their launch participation status. Interorbital Systems, launch provider and member of the Google Lunar X PRIZE Team SYNERGY MOON, will fly its own team’s electronics and communication package. This is identical to the one slated to be carried by its lunar rover on the surface of the Moon on the suborbital launch of the CPM 2.0 GTV. The flight will test the comms unit’s behavior under the stresses of launch. The NEPTUNE rocket test article that will carry all payloads listed in this article is also being tested on this launch for use as the main structural and propulsion component for SYNERGY MOON’s LUNA Moon Rocket, which it will fly in its bid to win the Google Lunar X PRIZE. Interorbital will use its NEPTUNE 3 (N3) LUNA, a 3-module, 4-stage NEPTUNE Rocket variant to carry the GLXP payload to the Lunar surface. 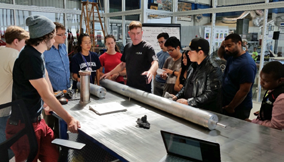 Interorbital has begun a series of rocket-building classes held weekly at Tomorrow’s Aeronautical Museum at the Compton/Woodley Airport. Each class is an exercise in workforce development with structured engineering and hands-on skills training organized and taught by Roderick Milliron who developed the curriculum with IOS partner and educator Randa Milliron. Students learn by doing as they participate in the build of an Interorbital Neutrino bi-propellant liquid rocket kit.